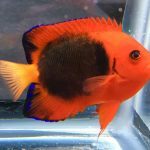 Angelfish in orange w blue/purple tail. This species is Endemic to Hawaii. 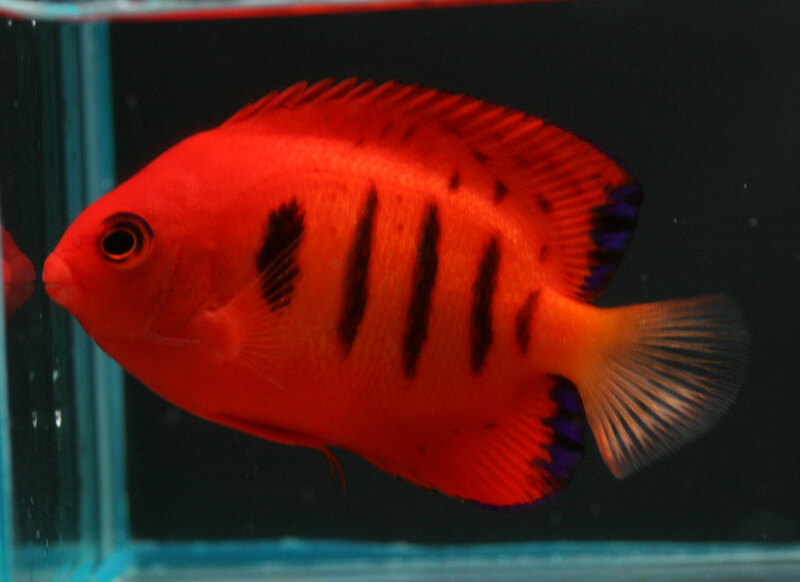 When it comes to aquarium exports, one of the more commonly seen species is the vibrantly colored “Centropyge” potteri. Potter’s Angelfish is endemic to both the Hawaiian Islands and Johnston Atoll and is reported to be the most common member of the family here. It has a passing resemblance to the familiar Coral Beauty (C. bispinosus), a species widespread in the Indo-Pacific but suspiciously absent from Hawaii. The two are likely sister species, and recent genetic study has shown that they belong to a larger group that is fundamentally distinct from the type species of the genus. The quotation marks I use around the genus name alludes to the need for taxonomic revision of this group, as there are multiple evolutionary lineages presently hiding under this single name. While this might seem a minor point, it’s worth mention that there are no true Centropyge native to the Hawaiian Islands. Why this is so remains a mystery worthy of investigation. Variations seen in C. potteri. 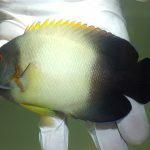 Fisher’s Angelfish (“Xyphipops” fisheri) is, by angelfish standards, quite a drab species, and, naturally, there is relatively little demand for it within the aquarium trade. Originally described from Hawaii, the concept of this taxon was later expanded in definition to include other similar populations from throughout the Pacific (formerly treated as C. flavicauda). 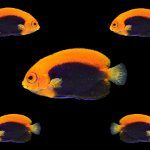 These, in turn, find their closest relatives in the African Flameback Angelfish (“Xyphipops” acanthops), found throughout the Western Indian Ocean, along with several familiar Atlantic species, like the Cherub Angelfish et cetera. C. fisheri variation at Johnston Atoll (left) & “flavicauda” from Palau (right). Credit: Diverdave & Luiz Rocha. 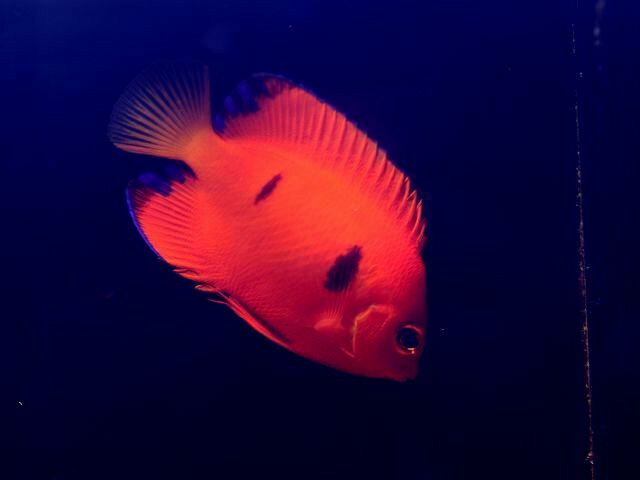 The Flame Angelfish, C. loriculus, is one of the more iconic and desirable aquarium fishes, and it is a species often heavily associated with Hawaii. But it may come as a surprise to learn that it is not an especially common species in this region, despite the vast majority of aquarium specimens shipping from Honolulu. This is an artifact of the routes commercial airlines take, as most loriculus actually originate from Kiritimati, which lies to the south of Hawaii. The Flame Angelfish is primarily known from islands of the Pacific Plate, just barely extending its range into some of the adjacent reefs in the West Pacific. The Hawaiian population is often reported to be distinct in its color pattern, having a more deeply reddened hue and reduced black barring along the body. On the other hand, throughout most of the Central Pacific this fish has a faded orange coloration, with thicker and more-irregular bars. Another phenotype occurs in French Polynesia and the Marquesas, where the body is again orange, but with only pale indications of barring and a single prominent blotch near the pectoral fin. While there may be some truth to these generalities, there are numerous exceptions. 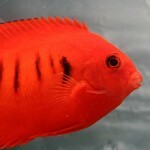 To wit, there are orange Flame Angelfish in Hawaii and red Flame Angelfish elsewhere. Even the bizarre Marquesan form can be found elsewhere on occasion, as evidenced by aquarium specimens that turn up now and then. There has been a biogeographic genetic study done in an effort to determine if there was perhaps more than one species present amongst all this variation, but the single gene which was analyzed failed to show any distinct populations within its range. 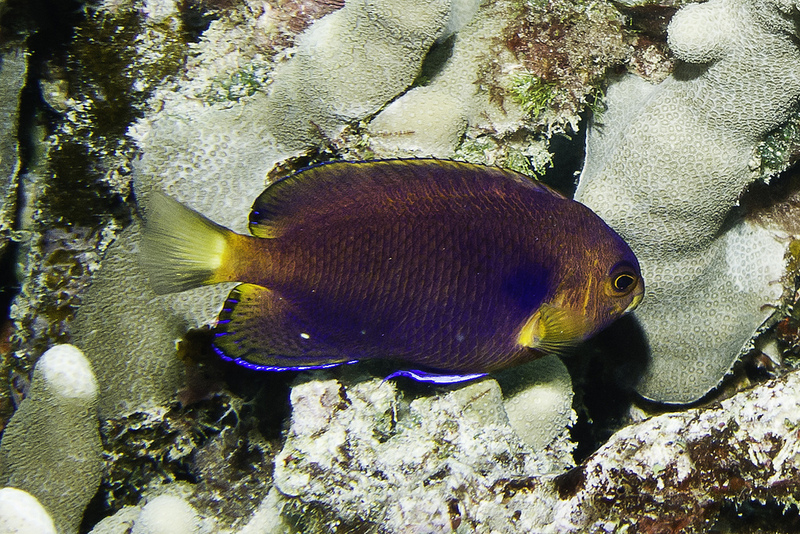 This may be an artifact of the limited genetic data used, as a more recent study focusing on the Orange-shoulder Tang (Gaither et al. 2015) has shown that Marquesan fish are undergoing a unique amount of divergent selection relative to other ecoregions. What this means is that environmental conditions in the Marquesas are different enough to actively favor natural selection, whereas in other regions the main driver of genetic differentiation is related to isolation from nearby populations. 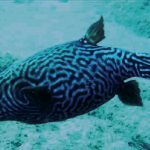 Hawaiian fish were thus shown to be significantly different from other Central Pacific regions, but it is apparently due more to the minimal genetic connectivity of Hawaiian fish with other populations rather than than any factors directly stimulating natural selection. A bigger question to look at is how Hawaii got its Flames in the first place. Were the islands colonized first from the nearby Marshall Islands or, instead, from the more southerly Line Islands? Or is it possible Hawaii was instead the birthplace for this fish? At nearby Johnston Atoll—a region which shares much of its ichthyofauna with Hawaii—both red and orange variations can be found, with little indication of intermediates. It is not known if the two separate due to assortative mating (i.e. 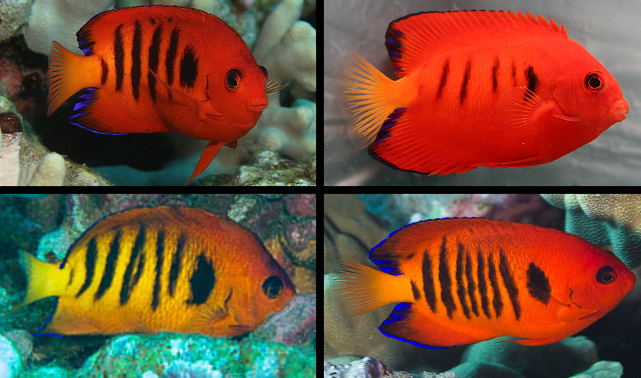 sexual selection), or if the genetics of hybrid reproduction in this species results in an either/or situation, where the offspring are either the orange or red morph. 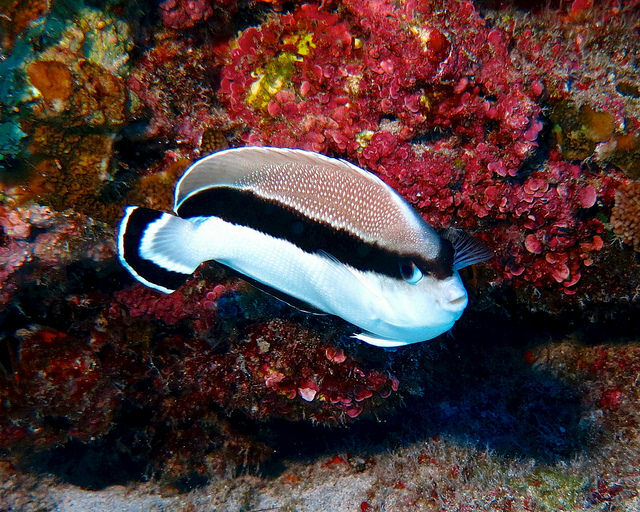 This might argue for the nearby Marshall Islands having seeded Hawaii with loriculus, but consider the similarities between the popular tinkeri Butterflyfish with Chaetodon declivis from Kiritimati. It’s dangerous to compare across taxa like this, and it appears that for some groups Hawaii is a center of origin, while for others it is a recent colonization.